When Will Xi Jinping Travel to North Korea? After a fourth visit by Kim to China, it’s Xi’s turn to travel to North Korea. Kim Jong Un’s diplomatic calendar for 2019 officially began last week, when he visited Beijing unannounced for a short visit to coincide with what was likely his thirty-fifth birthday. The trip marked his fourth encounter with Xi after three previous meetings in 2018—all in China. As during their initial encounter in March 2018—the first meeting between Kim and a foreign head of state since his ascent to the seat of power in Pyongyang in December 2011—Xi accepted an invitation from Kim to visit North Korea soon. There’s still no indication that Xi is likely to visit North Korea anytime soon. 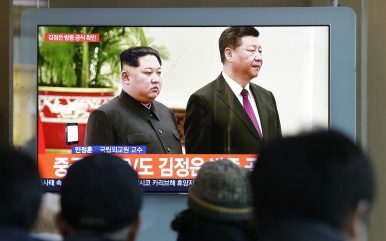 As North Korea state media’s official report on the latest Xi-Kim encounter noted, the two leaders did acknowledge that 2019 will mark the 70th anniversary of bilateral ties between the two states. Just days after Mao Zedong proclaimed the founding of the People’s Republic of China on October 1, 1979, Kim Il Sung extended diplomatic recognition—on October 6. China will have its own 70th anniversary events later this year, but it’s not unimaginable that the two sides might choose to use the occasion of seventy years of diplomatic ties for a trip by Xi to Pyongyang. Following the latest Kim-Xi meeting in Beijing, the Chinese Ministry of Foreign Affairs addressed rumors that Xi would travel to Pyongyang as early as April this year—possibly around the time of North Korea’s Day of the Sun national holiday to commemorate Kim Il Sung’s birthday. The emphasis on “high-level exchanges” by the Foreign Ministry is no accident. During their first meeting last March, Xi laid out four principles that should guide relations between Beijing and Pyongyang. The first of these was to have high-level exchanges between the two sides continue. “High-level exchanges have always played the most important guiding and promoting role in the history of China-DPRK relations,” Xi was paraphrased as having said by Chinese state media. In a second point, Xi underlined that these “high-level exchanges” would serve the purpose of allowing for “strategic communication” between the two sides. That appears to have panned out—with Kim visiting Xi both before and after his June 12 summit meeting with U.S. President Donald J. Trump last year. His latest trip to Beijing, meanwhile, comes as the United States and North Korea work out the details for a second leader’s level summit. Even as we wait for a trip by Xi to Pyongyang, it is possible that a senior member of the Chinese political establishment—including a member of the Politburo Standing Committee (PBSC)—might travel to North Korea first. During Kim’s time in Beijing, a few characters outside of Xi played prominent roles. For instance, Wang Huning, a PBSC member, received Kim upon his arrival, participated in his site visits in Beijing, and even sent Kim off. However and whenever it comes, it does indeed appear that we will get a trip by Xi this year to Pyongyang. Kim Jong Un to Make Third Trip to China, One Week After Singapore Summit With TrumpKim Jong-un Congratulates Xi Jinping on His Reappointment to a Second Term as China's PresidentKim Jong-un's China Reset Continues With Senior CCP Official's VisitWhat Trump's Team Need to Know About the Kim-Xi Meeting in BeijingA Mysterious North Korean Delegation Has Arrived in Beijing: Who's Visiting?